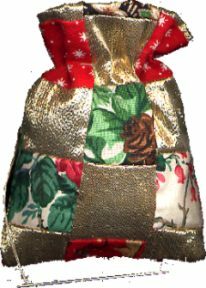 The bag can be made from a solid piece of fabric or it can be made from pieced fabric. Either way-- the final piece of fabric that is cut for the bag should measure -- between 5 1/2 - 6 inches wide and 5 1/2 inches long. In the image to the right, you can see some of my bags. 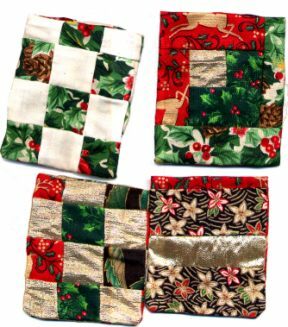 They are not of uniform size, the size depended on the scraps I sewed together. Some of the bags were 6 1/2 inches wide and some were the size specified above. Fold the fabric in half and sew the bottom and the side. The seams should be 1/4 of an inch wide.Turn right-side out. Fold around 1 1/2 inch of the top edge to the inside of the bag. Add a little stuffing to your bag. The bag should not be stuffed full. The bag should have enough stuffing to cause it to puff out just a little. Glue a 1/4 inch pom-pom to the 1 inch pom-pom. 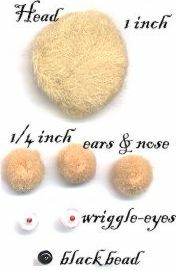 Glue the two wriggle eyes against the nose at around 10 O'clock and 2 O'clock. Glue two 1/4 inch pom-poms to the "top of the bear's head", in an imaginary line from his nose through his eye (at around 10'o'clock and 2'o'clock also). Glue a bead to the top of the bear's nose. Take up the bag again and with the sewing needle and matching thread, sew running stitches all around the bag about 3/4 inch down from the top of the bag. ->Start the stitching at the back of the bag and end the stitching at the back of the bag. Pull the thread to gather the bag slightly. There should be an opening in the bag that is a bit over 1 inch wide at the gathered part. Tie the thread, but do not cut it yet, leave it hanging for now. Fold the top of the bag down and fill the area with white glue. Add the bear head to the middle of the bag. Make sure it is touching the glue, if not either add more poly-fill and more glue or just add more glue. On each side of the bag, where the paws will go, add a dot of glue. The glue should be on both the bag and the bear head. 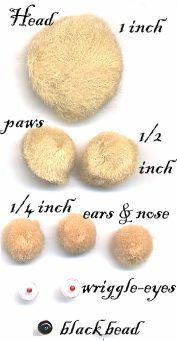 Place a 1/2 inch pom-pom next to each side of the bear head on the glue. Pick up the dangling needle and thread and run it from back to front through the bottom of the bear head. Tie the thread off, but do not cut it yet. Cut a 14 inch piece of embroidery floss and wrap it around the gathered portion of the bag. Tie it off at the BACK of the bag. Bring the ends together and tie them together in a knot. This makes the loop to hang the bear. With the dangling needle and thread, take one little stitch over the embroidery floss to make it stay put at the front of the bag. Do not cut the thread yet. Cut an 8 inch piece of cording. Knot each end of the cording and add a little glue to each knot to make it stay knotted. Fold the cording in half. Place the cording on the middle of the gathered front of the bag. 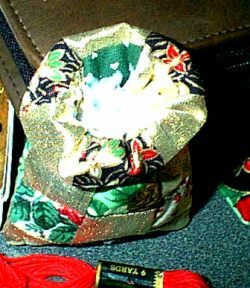 With the dangling needle and thread, sew the cording to the bag. Tie off the sewing thread and cut it. If you wish to further spruce up the bear, cut tiny bear pads out of black or brown felt and glue them to his paws.